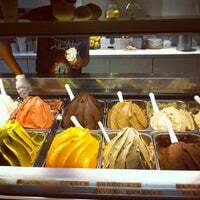 Nice small spot located near St. Marks with various flavors of gelato. Their espresso drinks are great with their delicious pastries. Good spot for meeting up with a small group of friends. Wifi here. Great late night work spot. Awesome gelato and desserts, good Wi-Fi (password is “mango123”), outlets, and a restroom next door (ask for the key). May close up to 45 min early if not busy. One of Manhattan's best kept secrets. Everything here is amazing, made with the best ingredients. Definitely try the ferrero icecream and the butter croissant with prosciutto cotto and swiss cheese!! unexpectedly, these are some of my favorite croissants in the city. also, their salami sandwich is amazing and not overwhelmingly large. ps: deb from smitten kitchen hangs out here during the day! 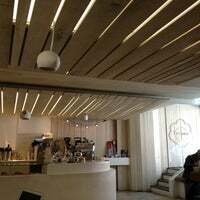 An amazing coffee shop that I stumbled across. The food selection is unbeatable- I tried their salted crumble gelato, white choc macademian cookie and maple pecan granola parfait and loved them all. The ferrero tastes IDENTICAL to the Ferrero Rocher candy. This is madness. And alchemy. I am in love. 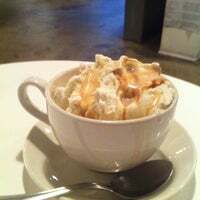 Also recommend the affogato with vanilla bean, the chai latte and nutella banana croissants! Adorable decor. Simple yet clean. Each flavor is unique and true to it's name. I recommend the chocolate sorbet and rose water, my two favorites. Love this place. 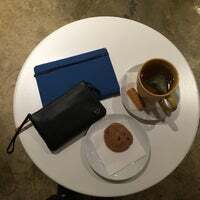 Friendly service, affordable coffee and delicious food and pastries. Rarely crowded. 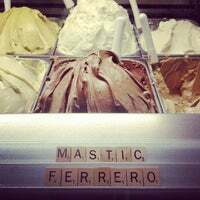 I bet the gelato is really good too but I consider it a coffee shop. A variety of gelato and sorbet is served at this cozy café, including a Passionfruit Mojito, Piña Colada, and old-fashioned Vanilla. Great atmosphere and environment for meeting up with friends or doing work. 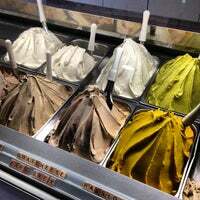 Gelato is good - try their interesting flavors! 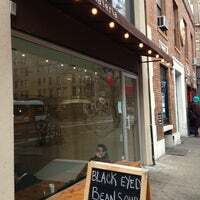 Tip: If you're a coffee snob, this place is not for you. Yup, I agree, the gelato is pretty amazing. But the cookies, muffins, and other pastries are the real dark horses here! I normally don't leave tips, but seriously the best gelato in all of Manhattan and surrounding boroughs. Pistachio, goat cheese, Ferraro, anything really. And the owner is awesomesauce. Croissants from Ceci Cela, wonderfully affordable salads and sandwiches, and well crafted coffee. Plus the waitstaff can't be beat! Some of the nicest people in town. 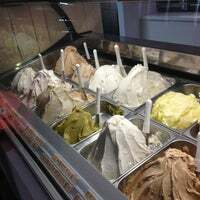 The gelato is amazing, but their food is great too! Sandwiches, salads, etc. They have tons of veggie and vegan options as well. Plus the staff are the sweetest. All of the drinks come with a cute little cookie. The gelato is also delicious. If you need the bathroom, it's behind the Ukrainian restaurant next door. Americano was fantastic, well-balanced. Sampled some unusual and delicious gelato flavors: rosewater and goat cheese. Gorgeous space - cute for a quiet morning. Chocolate lovers must try the dark chocolate sorbet, yes I said sorbet. It is to die for. Hard to believe the mango sorbet is a sorbetto! As rich as most a gelato, and with very little sugar added, it's delicious and healthy, the perfect dessert. I love the goat cheese gelato. The owners and staff are the BEST, and very welcoming. I come from Brooklyn just be in this great energy! 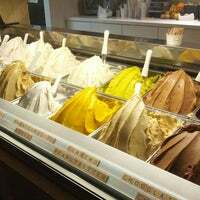 Gelato is awesome with amazing flavors.Super sophisticated design ,great coffee,very friendly owners.Highly recommended!! Must try lemon basil and rosewater! You can never go wrong with vanilla bean. Beats half the gelato I've had in Italy.... Flavors are strong and texture is creamy. 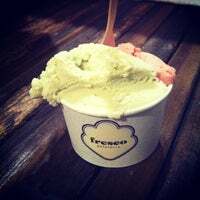 Try the rosewater, pistachio, and the sorbets! I love this place. They have great unusual flavors. The rosewater gelato is a must try, as well as the espresso. 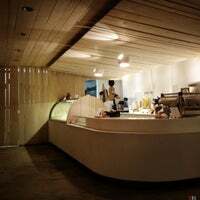 This gelato shop doubles as a cafe and does so beautifully. They brew La Colombe coffee. & their Nutella croissants are amazing! Get half peanut butter and half chocolate in a waffle cone and enjoy the richest and creamiest gelato experience in NYC. 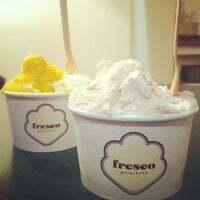 Fresco's salted caramel gelato is less salty, less sweet, and much better than most of its ice cream cousins. It's won over a non-believer in the flavor. Spent forever searching for a cute place that serves coffee and sandwiches in the area during a snow day and found this gem! Get the fig. Unless you're deathly allergic to figs. In which case, have an epipen on hand, and then get the fig. 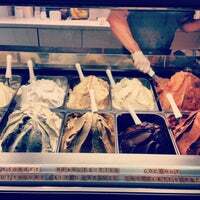 Best ice cream in Manhattan, clean fresh flavors that are like nothing else. Owned by lovely brother and sister. Such a cute place. Staff is so friendly. Baked goods are delicious. Vegan menu and gelato is awesome! Treat yourself to their chai latte - subtle but so good. I can't stay away so I get it twice a week. No regrets. Ferrero and Stracciatella flavors are amazing. The place itself is great looking as well. Pop in on a cold day for a cup of hot chocolate. It's a great spot to people watch! Everything is delicious! Goat cheese and mojito gelato= yum!! The quinoa granola bowl with fruit and ricotta is the best breakfast, I crave it always. Aside from the crazy good gelato, this is a cute and cozy place to do some work. Best gelato I ever had so far! Try matcha + yogurt! Good place to take kids. Loud if you're not a kid. Get a delicious gelato to go. Amazing gelato and the owner is often there looking over the place. Great small biz. 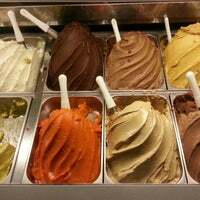 Their vegan gelato is fantastic! Better than van leeuwens and never a huge line. Any of the Greek salads or sandwiches are great here. Not the ice cream. "Taro and Black sesame is the most original and delicious combo you wont't find in the other ice cream shops around!" "Speculoos ice cream with the waffle cone is my everything"
"Love this place! Comfy and clean, good lineup"
"Cuisine savoureuse, surprenante... Délicieuse. Ouvert H24👍🏼"